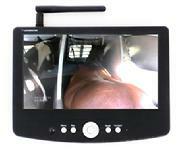 It is built for horse trailers, a barn 400 ft. away, or in a high interference wireless environment. Trailer Eyes® TE-0115 is easy to set up and can be up and running in 5 minutes without the help of any tools.The set can be powered by a 9V battery, 12V DC , 110/240V AC or an emergency jump start battery pack. Split view in & behind the trailer, additional cameras required for split view images. 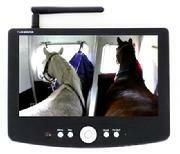 Split screen 3-horse & behind the trailer, additional cameras required for split view images. All parts are included for trailer to truck & barn to house setup. 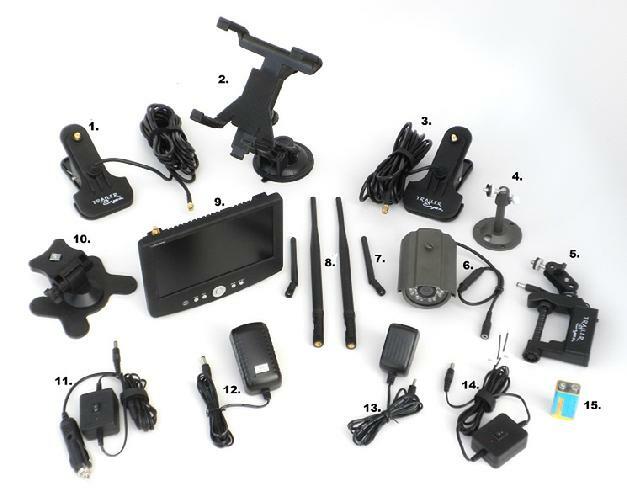 TE-0115 set comes with one monitor and one camera, if you wish to have multiple views on the screen, additional cameras are required. Connect the booster antenna to the camera. 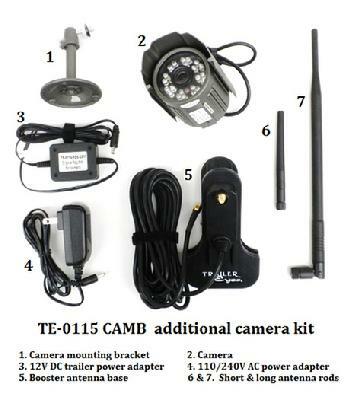 Provide power to the camera, either through a 9V battery, or by hardwiring the 5V power regulator to trailer’s power source (additional installation time will be required) , or use the 110V power adapter in the barn. Use the clamping mounting bracket to mount the camera on the desired spot. Secure the booster antenna to the outside of the trailer or barn (the antenna has a clamping and magnetic base). Connect the booster antenna to the monitor. Use the windshield mounting bracket or desktop stand to secure the monitor. Plug the power cord into the car lighter jack or use 110V power adapter in the house. Secure the booster antenna to the outside of the vehicle or house (the antenna has a clamping and magnetic base). After power is provided, please wait 5 to 10 seconds to let the monitor and camera establish the wireless connection, once the observation object pop-up. Please email us at info@trailereyes.com for any questions. Thank you.